How do non-electric water ionizer systems compare to traditional electric models? As far as their ability to produce alkaline water they can be considered “comparable.” But when it comes to the major benefits of alkaline ionized water, the non-electric models fall short. Alkaline water is available almost anywhere. You can find it bottled in grocery and health food stores. You can find it bottled online from many sources. And you can also find several filtration systems that contain media that will alkalize your tap water. These types of alkaline water will have a pH of 8.5 to 9.5 created by adding alkaline minerals to the water. What they don’t offer are the antioxidant properties found in alkaline ionized water, which is produced through the process of electrolysis. Non-electric “water ionizers” will be made of two to four internal filters. At least one of the filters will be dedicated to removing contaminants from the water. The other filters will contain minerals that are released in the water elevating the pH. Some will also have magnets or mineral combinations designed to give the water a mild electrical charge through the process of ion exchange. The downside to most non-electric water ionizer systems is the inability to adjust the pH level of the water being produced. The pH level produced by a non-electric water ionizer will be based on the existing minerals in your source water. What you have is what you get. There is no option for neutral/purified water. There is no option for producing water at lower alkaline levels for small children or pets. And while most people choose alkaline ionized water primarily for drinking, one of the benefits of having a water ionizer is having access to clean, filtered water at several different pH levels that can be used for cooking. Using alkaline water at the 9.5 pH level for soups, marinades and some other common recipes – when it comes to boiling pasta, or making rice or beans, you have no “clean water” options – unless you buy bottled water. 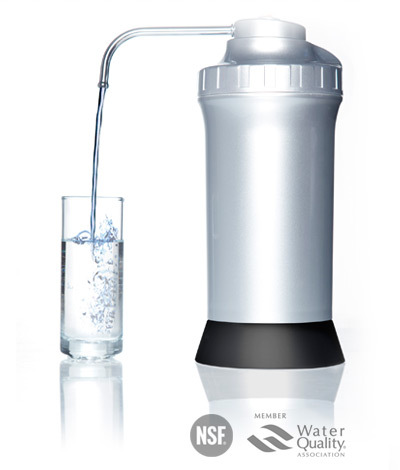 For most, getting a water ionizer was supposed to eliminate the need to buy bottled water. Responsible water ionizer dealers and ionized water advocates will tell you that there are times when you should not drink alkaline ionized water. At or near mealtimes, when taking prescription medications or certain supplements are times when you should non-ionized water. The ionization process speeds up the body’s absorption of prescription medications – which are designed to be released into the body at a certain rate. Taking Niacin supplements with ionized water can significantly intensify the “flush” that is common with Niacin. Within 30 to 45 minutes before and after meals, drinking alkaline water can interfere with the body’s ability to break down foods for proper absorption of nutrients. The alkaline water actually dilutes the acids in the stomach that breakdown the foods for proper digestion. Drinking alkaline water at or near mealtimes can result in indigestion, nausea, diarrhea and “cravings” as the body was unable to get the proper nutrients from the meal. Looking for water suitable for mixing formula or cereals for babies? Again, responsible water ionizer dealers will tell you that you should be using water at the neutral or purified setting on your water ionizer. Also, some people are sensitive to alkaline water above an 8.5 or 9.0 pH level. While most people in the household have no trouble drinking water at the 9.5 level, there are some that have unpleasant side effects drinking the 9.5 pH water. Over time many find that they are eventually able to work themselves up to a glass or two a day at the common 9.5 pH but they need a slightly milder alkaline alternative for regular use. While drinking alkaline water is beneficial, the antioxidant properties are what make alkaline ionized water unique. Most people researching water ionizer technology are doing so after hearing about the health benefits of alkaline ionized water. The majority of those health benefits come from the antioxidant properties created during the ionization process – electrolysis. Knowing this, non-electric water ionizer designers have developed these products with blends of minerals and medias that do offer a mild electric charge. And in most cases there will be some antioxidant properties to the water. However no non-electric water ionizer option can produce the same level of antioxidants found in standard electric water ionizers. There is one company advertising a non-electric model that does offer adjust-ability. This model won’t be available until sometime in May – But is it worth the cost? At $1,495 this non-electric water ionizer is supposed to offer multiple alkaline levels and a neutral or purified setting to produce water for those times when alkaline ionized water is not appropriate for drinking. But one of the best selling water ionizers available is only $200 more – fully electric, fully adjustable and capable of producing the strong antioxidant benefits that most people are looking for when shopping for water ionizers. Before deciding a non-electric water ionizer is right for you, take a look at some of the standard electric models. In the long run you may find that you save money by having multiple alkaline and acidic levels suitable for all purposes – including several options for eliminating some chemical-laden household cleaners. I had someone forward me this article and thought I’d drop you a line. There we a couple of things that caught my eye. Electrolysis is only one way to ionize, and it’s actually the most unnatural way of doing so. You don’t find electric cords in nature shocking the water. It’s done thru natural chemical reactions. “However no non-electric water ionizer option can produce the same level of antioxidants found in standard electric water ionizers.” Who says extreme -ORPs (eg. -500 thru -700) are better for you? From my perspective it’s hard to beat nature. Water in it’s natural and intended state is what we should be drinking…adding electricity to it just doesn’t feel right. And what about the amount of free hydrogen created through the alkaStream, Revolutionizer or the Elita (if they get it working)? You can’t measure it with a meter, but basic chemistry proves that it’s there. I’d be happy to send you one and let you test it. Just let me know. I’d be happy to test the Alkastream or any other non-electric product you’d care to send. I don’t have a problem with the non-electrics, I just believe the electrical charge provides more antioxidants – which is why most people are considering a water ionizer in the first place. Glad I had a little voice in my head tell me to come back and check this today. Why didn’t you just send me an email so I knew you wanted to test an alkaStream? You have my contact info? You didn’t want me to not see your response did you? I find it interesting how much this article has changed since the first version I responded to. Now there is more I have to address. Most of which comes down a broad question. Natural vs. synthetic. Is natural food better than synthetic? How about vitamins and supplements…whole food or synthetic? Since you mentioned infants…breast milk or formula? Stove top heating or microwave? Why is synthetic (electric) ionized water the outlier? I know you’ve done a lot of research on ionized water. Where is the proof that low -ORPs are better for you? If there isn’t proof, then is it safer to assume what nature would create is better? At what point does the antioxidant become an oxidant. I know Dr. Young has talked about that, just can’t find it. You are also only focusing on -ORP as the antioxidant. I would encourage you to do some research on free hydrogen and how the body breaks it down after we drink. You can’t measure it with an mV meter. Non-electrics don’t rely on source minerals. The alkaStream sends water through a layer of minerals and utilizes water’s ability as a solvent to pick up what it wants and carry it into our glass. It’s why we work so well in-line with RO systems. If you don’t want a 9.5 pH, then speed up the flow of the water. The less time it’s in contact with the minerals and ionization media, the less potent it will be. Nice slow mineral shot in the morning as a detox, speed it later in the day. Just want filtered?…go full speed. There is plenty of variation available. Is the ability to make acidic water worth $2000 more when you can pick it up by the gallon at your local store for $0.89? What’s advertised as beauty water from an ionizer is lining the shelves at the grocery store. My family has been using bottle water for a year now and we haven’t missed a beat. And we only use what we need…the rest of the time it’s not running down the drain. Need the really low pH water, grab an activeIon for $189. Easy, portable, on demand, no chemicals needed and well worth the money. I’m glad you checked back – sorry it’s taken me so long to reply. First of all, there is nothing “synthetic” about water that is produced by a standard “plug in” electric water ionizer. Countertop water ionizers use an electrical current to alter the properties of the water the same way non-electrics use FIR and (electro) magnetic elements to alter the properties of the water. The only difference is the strength of the electromagnetic currents used. Personally, I’ve always been careful to inform “low ORP shoppers” that once the ORP gets stronger than a negative 350 reading, the body doesn’t process the extra as effectively. Most responsible water ionizer resellers will do the same. Most water ionizers will give you at least 5 different alkaline and acidic presets to choose from, plus a regular “filtered” setting which is the appropriate setting to use when taking prescription medications, mixing baby formula or for drinking with meals. This is not an option with non-electrics – at least not that I’ve seen so far. While you can increase or slow down the rate of flow with non-electrics to adjust the alkaline strength of the water, a “regular” electric water ionizer has presets that can be selected that will do this for you. The more advanced models let you customize the presets to the pH levels you use most often. No flow rate guess work, once the preset has been customized you just use that preset on the unit – flow rate will be the same for all levels unless you choose to slow it down to make even stronger water. Back to the extreme negative ORP levels, while your body can’t make much of those levels past the negative 350 point, the stronger ORP does have a positive impact on foods. Whether cooking or cleaning foods – the stronger ORP allows flavors to blend better when making soups or stews. Marinades penetrate meats and vegetables better, salad dressings stay blended better, fruits and vegetables soaked in the strongest levels of ionized alkaline water tend to be sweeter or lose the harshness of their flavor – and this stronger water does an excellent job when it comes to releasing dirt and pesticides from the surface of produce. Oh – and coffee – let’s not forget coffee. I make coffee every morning with alkaline water at a pH of 11.5 with an ORP of around -850. The flavor is considerably smoother. As for picking up a gallon of water at the store – I would be spending an average of at least $3/day – probably more. – and that’s just for cooking. In the morning I make my coffee using the strongest alkaline setting on my water ionizer. While I’m filling one container with strong alkaline water to make coffee, I’m filling another container with strong acidic water that I use for quick cleanups around the house during the day. Mealtime is my heavy water ionizer use time. Strong alkaline water to clean the greens I use in my salad, and I use the strong acidic water as a secondary rinse. If I’m using tomatoes I’ll let them soak in strong alkaline water to give them a sweeter flavor. I rinse my chicken or fish with acidic water to kill bacteria on the surface. My dog is on a natural raw food diet – I rinse her chicken drummettes in acidic water to make sure she doesn’t get any bad bacteria, and soak her broccolli in strong alkaline water to remove pesticides and give it a better flavor – she’s picky and notices the difference. You don’t get acidic options with non-electric water ionizers – at least not that I have seen so far. Wheat berries are a staple item here. Cooking them or pasta or rice in alkaline water at any level I have found leaves them sticky and/or mush. I use an acidic setting for cooking these and the texture comes out perfect. I was visiting friends this weekend and they were boiling water for pasta – I could smell the chlorine fumes from their tap water as soon as I walked into the kitchen. Acidic water is the go-to first aid treatment at my house. It helps small cuts and scrapes stop bleeding faster, relieves the pain of burns, wasp stings, insect bites. My father uses it for treating his sinuses and also puts drops in his eyes when they are itchy, dry or when he feels like he’s getting an eye infection. Bottom line, I advocate the use of “regular” electric water ionizers because you get more for your investment than just an overpriced drinking water machine. Non-electrics work fine for producing alkaline water for drinking, but they don’t give you the push-button flexibility you get with standard water ionizers capable of producing multiple levels of alkaline and acidic water. As far as the water produced by water ionizers being ‘synthetic,” it is no more synthetic than the water produced by a non-electric water ionizer, the only difference is the strength of the electro-magnetic current used. Non-electrics create ions using FIR and magnetic elements, electric water ionizers use electrical currents. The choice to let the acidic water go down the drain is just that, a choice. It’s rarely wasted in many households. Too many uses. Quick clean-ups, mouthwash, skin treatments, hair treatments – even just dumping it on the plants in your yard. Electric water ionizers aren’t for everyone – they are a good long-term value and I think they stand up just fine to non-electrics. What are the options with non-electric water ionizers for regular filtered water with no change in alkalinity or ionization? What about acidic levels for cooking and cleaning? What about the strongest alkaline water with high ORP that can effectively lift stains from carpet and fabrics instead of using chemical cleaners? I firmly believe that even some of the most expensive water ionizers are worth the investment when it comes to the varied uses and long-term benefits.